MUMBAI, India — HARMAN Professional India will exhibit a wide range of its latest audio and lighting products at PALM Expo India 2014 at the Bombay Exhibition Center, Mumbai, India, Booth D09 (May 29 – 31, 2014). Industry-leading products from AKG, BSS Audio, Crown, dbx, JBL, Lexicon, Martin Lighting and Soundcraft will be showcased at the booth. 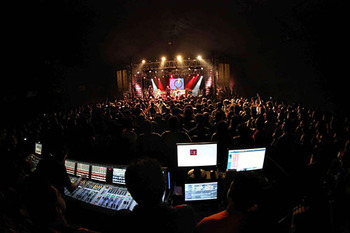 HARMAN PALM Live Arena, now in its 5th year will host a variety of India’s top musicians and performers throughout the show including percussion icons Sivamani and Ranjit Barot, Blackstratblues, Bhayanak Maut, Louis Banks, Mihir Joshi and many other artists. JBL VTX Series line arrays have redefined the performance capabilities and installation flexibility of professional sound reinforcement loudspeakers. The VTX Series is JBL’s flagship range of line array loudspeakers and subwoofers for tour and installed sound and incorporates JBL’s most advanced components, materials and technologies. The latest VTX V20 3-way 2x10” high-directivity line array elements, S25 suspendable, cardioid-arrayable dual-15-inch subwoofers and compact, high-performance F Series models will be in use at the HARMAN Palm Live Arena and featured in the booth. JBL’s CWT128 is a compact 2-way speaker that provides powerful, wide-angle coverage. The CWT128 is ideal for installed sound applications as it delivers full-range sound across a wide listening area, thanks to its Crossfired Waveguide Technology 160-degree horizontal dispersion, yet it takes up only one third of the footprint of two conventional speakers splayed side by side. Soundcraft Vi3000 – setting a new standard in digital live sound consoles, the Soundcraft Vi3000 offers a host of high-end features including a new ergonomic design, 96 channels to mix, new internal SpiderCore 40-bit floating point DSP, Dante compatibility and much more. The Soundcraft Vi3000 features a control surface with four Vistonics II™ 3-D touchscreen interfaces, making it the only console in its class that can be used by two engineers at the same time. Also featured at PALM 2014 will be Soundcraft’s ViSi Connect expansion cards, which add a 128-channel expansion bus to a console for connection to stageboxes, personal monitor systems, audio networks and DAWs for live recording. HiQnet Audio Architect is a common control platform for all devices in a sound system, from microphone to speaker. To facilitate system setup, Audio Architect utilizes graphical, diagrammatic representations of the installed or live sound venue, and the components and loudspeakers in the system. Devices “understand” both their physical and logical placement and the software “learns” how they are to be used, while offering extensive setup and configuration capabilities. The new dbx DriveRack PA2 Loudspeaker Management System enables a loudspeaker system to be quickly and accurately optimized for the best-possible sound quality. The PA2 is ideal for bands, musicians and artists who carry their own PA and for a wide range of installed sound applications. The DriveRack PA2 makes it easier than ever to set up a system and control it on the fly using an Android®, iOS®, Mac®, or Windows® mobile device or laptop. Martin MAC Quantum Wash lighting features the unique and expressive Colorganics™ system to create a stunning palette ranging from vivid colors to bright white. With features including 750 watts of RGBW LED power, high-speed movement and a 1:5 zoom, the rugged, compact and efficient MAC Quantum Wash is ideal for creating beautiful wash effects with wide, powerful and bright beams on any stage. “PALM 2014 continues to grow every year, as does HARMAN Professional’s presence and commitment to India, making this annual industry event the ideal venue for us to demonstrate the benefits and technologies of our brands for professionals in every segment – be they musicians, sound engineers, DJs or just sound enthusiasts.” said Ankush Agarwal, Director, Business Development and Marketing HARMAN Professional India.